Can also be concealed behind eaves or parapet or in the roof valley. The other gutters with which box gutter should not be confused are called the valley flashings or the valley gutters. They are not placed between the parallel surfaces rather they are installed at right angles at the internal corners of the pitched roofs. The box gutters are giving a provision to give a good rain flow to the outlet with the minimum and maximum slope of 1:400 and 1:200 respectively. There are many instances that we come across when the box gutters do not have a good or proper provision for appropriate overflow. Plumbers are always reminded about the proper size and design which is required for the installation to get an appropriate provision for the overflow. In case of a failed installation, a lot of damage is done to the house and its structure resulting in a number of insurance claims. Sump with high-capacity overflow device. These options give provisions for overflow to the box gutter. Determine the design flow. You can make a graph of it for better understanding. Determine the width of the gutter. 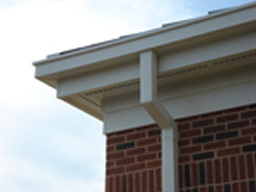 You may require referring the plan of your gutter to determine its width. It is generally specified and marked by the architect. Determine the gutter gradient. Again, to determine this, you will need to refer to the plan. It is also specified by the architect only. Determine the minimum depth of the gutter. To do this, you need to start with the gutter gradient intersection and draw a line up the ‘design graph for a voluntarily discharging box gutter’ chart. The line that you draw will complement the minimum gutter depth. You can get industrial/commercial box gutters in a huge range of size. They may start from 150×150 to 200×200 (600 girth) which is among the biggest box gutter in most countries. It can handle almost all the roofing applications. Minimum box gutter width for commercial construction is 300 mm and for domestic construction it is 200 mm. Hence, the required gutter slop for these sizes is 1:40 to 1:200. It is generally confusing to find how the slope of the box gutter is going to affect the overall depth of the gutter. Hence, it is always better to be prepared with your calculations in the matter. Decay to gutters and roofs can be suddenly increased by high winds and storm. Hence, it is essential that guttering and roofing be thoroughly checked after these events and on a regular basis so that defects can then be discovered in the early stages itself and quick repairing can be done before any further damage is caused.